This Christmas cube with a cute Christmas bear is great for and office or small home. 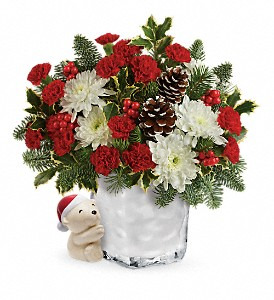 Carnations, Poms, Berries and cones. 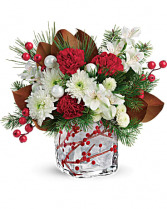 Adorned with winter berries and a sprinkling of sparkling glitter, this frosted glass cube and classic Christmas bouquet is a wondrous holiday surprise! White alstroemeria, red carnations, white button spray chrysanthemums are accented with magnolia leaves, white pine, and douglas fir. 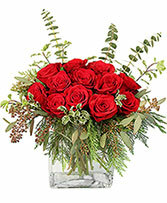 Delivered in a Winterberry Kisses cube.